The St. Louis Weekend Events Guide for Thursday, June 30th through Monday, July 4th, 2016. For 2016 fireworks festivals & parades, please check out our Fireworks in St. Louis post. 2016 Freedom 4 Miler: The city’s most patriotic race. Celebrate the land of the free because of the brave! The 5th annual 4 mile run will include the annual “Most Patriotic” Costume Contest, a unit of soldiers running in cadence, an Armed Forces division, a Humvee to lead off the race, face painting, and more. The Official Military Partner of the Freedom 4 Miler presented by Schnucks is the USO of Missouri. A portion of the proceeds from this year’s race and all donations will go to the USO. Head over to watch the VP parade at 9:30am. Register before June 30 and pay $30. Day of registration is $35. 134th Veiled Prophet Parade: The annual parade following the Freedom 4 Miler, begins at 9:30am. The Honor Flight Network, a national non-profit organization dedicated to providing honor and closure to America’s military service veterans, will be the Honorary Grand Marshal.There will be a variety of bands marching in the parade from local high schools, plus the 371st U.S. Army Band and John Ford Highland Pipe Band. The parade theme is “Hats Off To Heroes” and there will be 20+ floats and balloons parading down Market dressed up with the theme. Come out and support and celebrate America. 5k Run or Walk $35; 1 mile Walk $25. 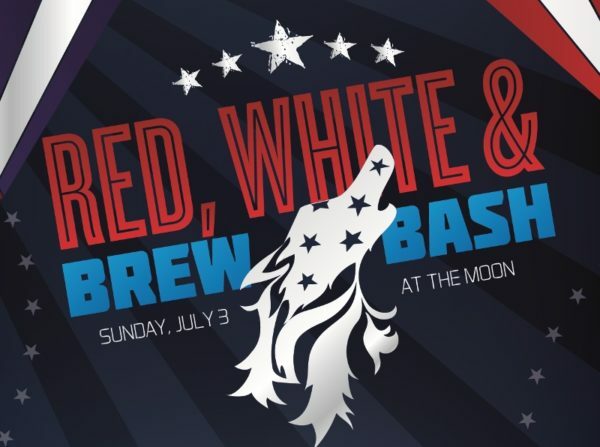 Red, White & Brew: Howl at the Moon in Ballpark Village is celebrating America’s birthday with great music and great drink specials. Come for the brews, stay for the party! You can expect lots of dancing, drinks, fun games, and prizes! Drink specials include: $3 Sam Adams, $5 1800 Margarita cocktails, and $20 86oz firework buckets. There will be a ‘Murica themed buffet. Come dressed in red, white and blue and get a free drink with drink purchase. Doors open at 3pm. St. Louis Cardinals: The Cardinals take on the Milwaukee Brewers at home this 4th of July weekend. As is tradition, there will be fireworks after Friday evening’s game. Additonally, the first 25,000 fans in the door 16 and older get a Replica 1926 World Series Ring. Saturday’s game promotion is an adult replica Matt Carpenter batting practice jersey. Sunday’s game giveaway is a Cardinals cooler backpack. A Cast of Blues: The newest traveling exhibit at the National Blues Museum: Sharon McConnell-Dickerson’s “A Cast of Blues.” The exhibit is composed of the life-cast masks of 40 blues musicians, including Big George Brock, David “Honeyboy” Edwards, and Ruth Brown. The exhibit also includes a bronze sculpture of the hands of blues artist Johnny Winter. The exhibition has traveled through Mississippi, Cognac, France, and Dothan, Alabama and was recently seen at the Griot Black History Museum in St. Louis and at the Blues Hall of Fame in Memphis. In addition to checking out this exhibit on opening weekend, you can also see Tom Hall perform live on Saturday from 12-3pm for just $5. Chris Stapleton: I’m not sure if you’ll still be able to find tickets to this hot concert, but the hottest new country and bluegrass singer and songwriter, Chris Stapleton, who took off like a rocket with his breakthrough album Traveller, in 2015, will be coming to St. Louis this weekend with special guest Sam Lewis. Stapleton became the first artist to win Album of the Year, Male Vocalist of the Year and New Artist of the Year at the 2015 CMA Awards. He also received four Grammy Award nominations for the 2016 award show and won 2 of them: Best Country Album and Best Country Solo Performance. Chris is as talented as they come and if you’re lucky enough to get a ticket to this show, hold on to it. Carondelet Concerts in the Park: A longstanding annual celebration of diverse music, hosting local musicians at various parks in the Carondelet neighborhood. These concerts have been a staple in the community for more than 25 years, attracting thousands of attendees. Each week features a different variety of music and other activities including craft fairs, childrens book-reading with the St. Louis Public Library during concert intermission and more. This week’s live music is from the KD Allen Blues Band. 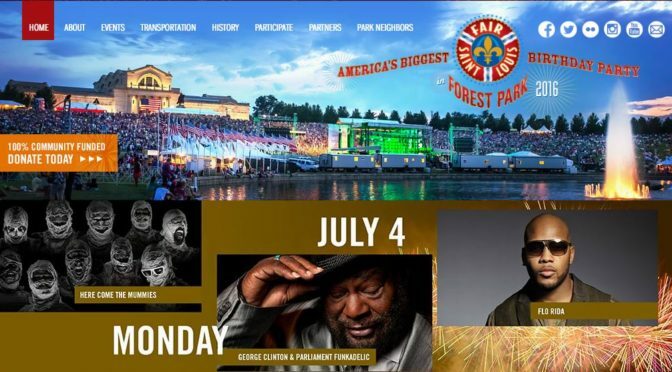 Fair St. Louis: This annual free concert and festival experience includes performances from Flo Rida, Sammy Hagar, Lee Brice, Eddie Money, George Clinton & Parliament Funkadelic, Bobby Bones & The Raging Idiots, Locash, Cowboy Mouth, Mo Pitney, and more in Forest Park followed by fireworks each night. Other features include: zip line, human slingshot, market-style shopping area, demonstrations by the Lake Saint Louis Water Ski Club, Salute to the Troops military appreciation event, the Ameren/Purina Family Festival Zone, the Purina Pro Plan Performance Team, and more. Riverfest: A four day festival in Frontier Park with live music, food and fun beginning Thursday at 5pm. There will be a parade beginning at 10am on the 4th. There will be live music from Patt Holt Veteran Tribute, Cree Ryder Family Band, Spazmatics, and more plus food and crafts, and fireworks on the Missouri River on the 3rd and 4th at 9:20pm. Summer Concert Series: A free and family friendly event with a spot for the kids to play while the concerts are going on. Food and drinks available for purchase at our outdoor patio and our Country Store & Restaurant are open during the concert times. Dogs are allowed as long as they are on a leash. You might want to bring your own lawn chair as the provided tables and chairs tend to fill up fast! Live music will start at 7pm on Friday evening with The Jeremiah Johnson Band and 7pm on Saturday with Old Salt Union.